It is hard to imagine the stakes in this campaign being any higher. If we do not win the race in Idaho’s first congressional district, we could end up with a “never Trumper” that once said that Donald Trump “can go straight to hell” occupying one of Idaho’s seats in the U.S. House of Representatives. And if the Democrats tried to impeach Trump after the 2018 mid-term elections, he would vote with them in a heartbeat. If you want to keep this “never Trumper” from winning this election, please contribute to our campaign, because right now he has raised more money then we have. Luke Malek is currently a member of the Idaho legislature. He holds District 4 House Seat A which represents part of Kootenai County. He defeated all challengers in 2012, 2014 and 2016, and now he wants to move up to the federal level. During his first quarter of fundraising, he raised far more money from donors than any of the other candidates in this race did. The “anti-Trumpers” in the Idaho political establishment are getting behind him in a major way, and many people believe that he will ultimately win this race. That should be enough to completely disqualify him from this race, but amazingly there are still plenty of Idahoans that are supporting him. 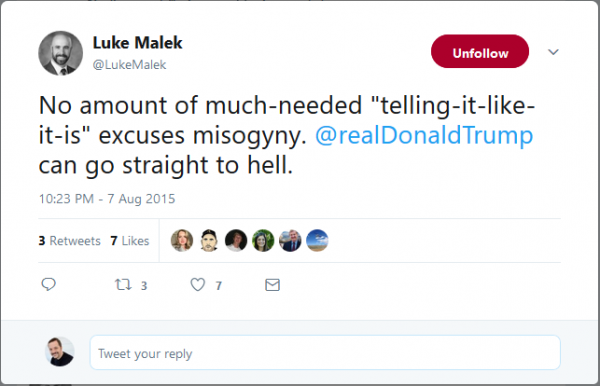 So it is absolutely imperative that we expose Luke Malek, because we don’t want a single Trump supporter to be tricked into voting for him. Are you guys starting to understand why it is so imperative for pro-Trump candidates to run for Congress? If we don’t run, guys like Malek will grab those seats. If you can, please donate to our campaign today. We desperately need more signs, more brochures and more mailers. Malek is leading us in fundraising so far, but with your help we can close that gap. -Luke Malek voted for the Obamacare state exchange and was the Governor Otter and Lt Governor Brad Little point person (Freshmen 16) on making Idaho the first Republican controlled State to embrace Obamacare. -Luke Malek is anti-Second Amendment. Luke Malek told an interviewer from “Point of Personal Privilege Podcast” that he would be open to …some forms of gun control. For example he could support banning “bump stocks” which everyone knows is just a way to impose more gun control. The Federalist reportsthat the “bump stock” ban would ban all semi-automatic rifles. The NRA reportsthat the “bump stock” ban bill would also ban muskets. -Luke Malek voted Nay with only nine other Republicans to limit civil asset forfeiture in Idaho. Civil Asset forfeiture is where the police state can seize your property without charging you with a crime and you have to hire a lawyer to get it back. -Luke Malek has an F (43%) from the Idaho Freedom Foundation (IFF) 2017 Index rating. Is this the kind of person that you want making decisions for you and your family in Congress? Because the decisions that Luke would make in Washington won’t just affect Idaho. They will affect every man, woman and child in the entire country. Please help us today. In 2017, Luke Malek actually had a worse voting record than the Bernie Sanders-loving socialist that is running for governor as a Democrat. 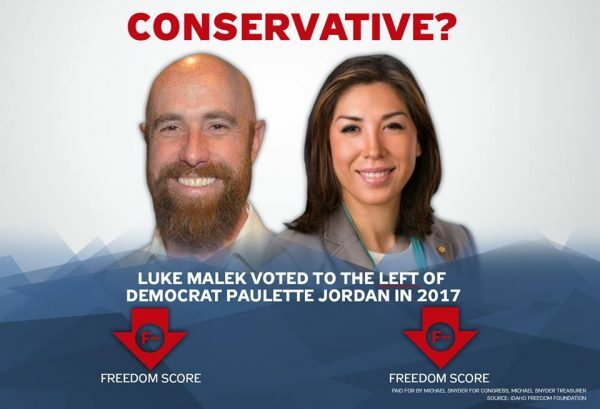 According to the Idaho Freedom Foundation, Luke Malek had a more liberal voting record in 2017 than Paulette Jordan did. The good news is that if we work together we will win this race and Luke Malek will never go to Washington. The first candidate debate in our race was held in Coeur d’Alene on Sunday, and if you haven’t watched it yet you can find the highest quality version on YouTube right here. With less than four months to go, this race is super close, and it is one of the few races around the country that is completely up for grabs. If you would like to see our campaign defeat Luke Malek, please consider making a donation to the campaign. I am not sure that I even have the words to describe how much we need it right now. We have a far more conservative message than Luke Malek does, but if he massively outspends us he could end up winning anyway. If the election was held today, we literally do not know who would win. If Malek and other “never Trumpers” go to Washington, and the Democrats are able to pick up more seats during the 2018 mid-term elections, it is quite likely that Donald Trump will be impeached before we even get to the 2020 election. This race in Idaho is one of the key “pressure points” around the country that could literally determine the fate of the Trump presidency. If you stand with President Trump, please help our pro-Trump campaign for Congress. Donald Trump desperately needs more friends in Congress, but if Malek wins Idaho will instead be sending one of his worst enemies to Washington. We only have about 14 weeks left until election day, and the clock is ticking. If you would like to help us, now is the time. If would like to thank everyone that has helped us so far, and you have my word that we are going to do all that we can to make sure that we defeat Luke Malek.